The INX CP100 UV digital cylindrical printer is your answer for advanced performance, image quality, and UV LED technology. For prototyping, customized short runs, promotional items, and more, the CP100/800 gives you four-color capability with resolutions up to 1400 x 1400 dpi. 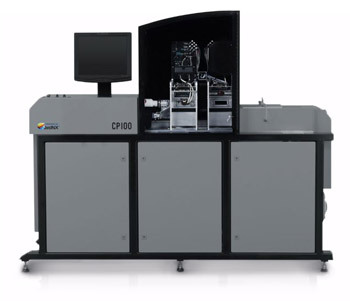 The CP100 is the most versatile direct-to-object inkjet printing system, designed to print on two-piece cans, bottles, or other cylindrical objects using four colors, white ink, and spot high-thickness varnish. The CP800 direct-to-object inkjet proofing system enables graphic designers, printing professionals, and industrial businesses to easily and efficiently produce a single digital proof or dozens for promotional purposes--or even hundreds for events and marketing tests.